The density of the product: Lasagna will keep hot longer than pizza or chicken nuggets, for example. 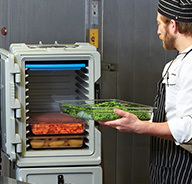 The starting temperature of the food before it is loaded into the carrier: As these are hot holding cabinets and not re-thermalizers, they are designed to maintain the temperature of the food. The hotter the food when loaded, the longer it will stay hot. How densely the food is packed in the carrier: The more food is packed in the carrier, the better the heat retention. Half empty compartments will retain heat for a shorter time. Frequency of opening the door: Fewer times means less heat loss from the compartment. The ambient temperature: Colder climate vs. warmer climate will also affect holding time. Despite these many variables to holding time, there are indeed some procedural tips that you can carry out to ensure maximum performance from your transporters. Slide a hot water pan into the bottom rails of your unit and close door for 20 minutes. Remove pan. Load with hot food. Close door promptly. 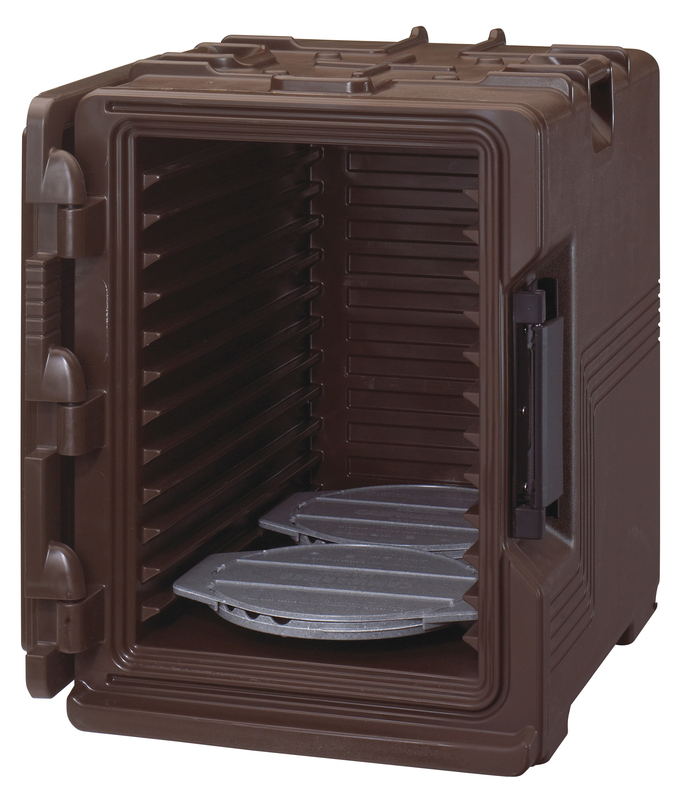 Heat 2 Camwarmers® in a 350°F oven for 45 minutes and slide it into the bottom rail of your unit. Close door for 20 minutes. Load with hot food. Close door promptly. Ideal: Use hot water pan method to pre-heat carrier, remove pan and slide Camwarmers into the bottom rail. Load with hot food. The Camwarmers will extend the hot holding time of your food beyond 4 hours. Slide an icy cold water pan into the bottom rails of your unit and close door for 20 minutes. Remove pan. Load with cold food. Close door promptly. 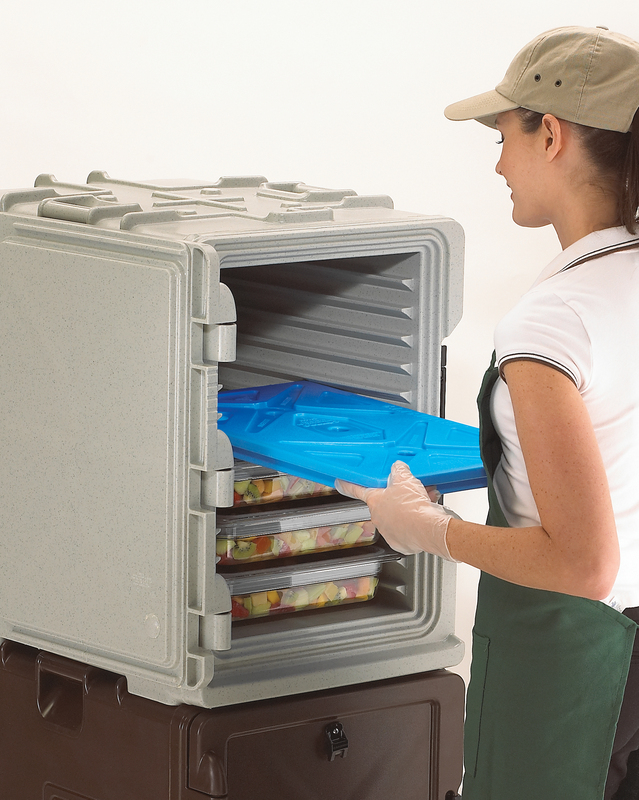 Place the entire carrier in your walk-in or freezer, if possible, with the door open for as long as possible, preferably overnight. Freeze a Camchiller® overnight and slide onto the top rail of your unit. Close door for 20 minutes. Load with cold food. Close door promptly. Ideal: Perform steps 1 OR 2, together with 3 to extend the cold holding time of your food beyond 4 hours. By following these simple steps to prep your carriers before loading with food, your hot or cold foods will be guaranteed to stay hot or cold for the longest time possible, greatly minimizing any risk of foodborne illness. Inspiration is in Full Speed at the 2015 SNA ANC!